Just 4 days before Christmas and my birthday! As always, my family and I are excited preparing for this special day. It's the time of the year when we have a back-to-back get together with our close friends to celebrate not only Jesus' birthday but my birthday too! We have two consecutive parties on the 24th and the 25th...we host a Noche Buena feast for our close friends at home on Christmas Eve, and then on Christmas Day, we have another party at a friend's house where we bring some food as part of my birthday celebration. Last Friday, I shared with you our Noche Buena Menu which is a combination of Filipino and American favorites. The said menu includes Roast Turkey which is something Ryan (the hubs) loves making for special occasions. This morning, I got a comment from a reader asking me to share the herbs and spices and the procedure for roasting turkey. I know that many of you also want to have roast turkey as part of your Christmas feast, so today, I want to share with you Ryan's way of roasting turkey. He has been doing this for the past 7 years, and I must say that his roast turkey has already achieved perfection. It's not only flavorful, it's also tender, so moist and juicy --- something that a Holiday Roast Turkey should be! Begin thawing the turkey in the refrigerator or in a cooler kept at 38 degrees F. When the bird is completely thawed, remove the neck, giblets, and liver from the cavity of the turkey and reserve for the gravy. Rinse the turkey inside and out under cold running water. Combine the vegetable stock, salt, brown sugar, peppercorns, ginger, rosemary and bay leaf in a large stockpot over medium-high heat. Stir occasionally to dissolve solids and bring to a boil. 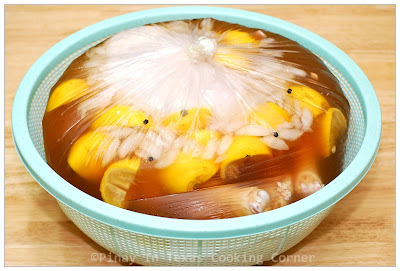 Then remove the brine from heat, let it cool to room temperature, and refrigerate. Combine the brine, heavily iced water and oranges in a 5-gallon bucket. Place the thawed turkey breast side down in brine. If necessary, weigh down the bird to ensure it is fully immersed, cover, and refrigerate or set in cool area for 8 to 16 hours or up until an hour before roasting, turning the bird once half way through the brining process. If your refrigerator will not fit a 5-gallon bucket, you can just use an oven bag to hold the the bird and the brine and seat it on a big mixing bowl. 1. 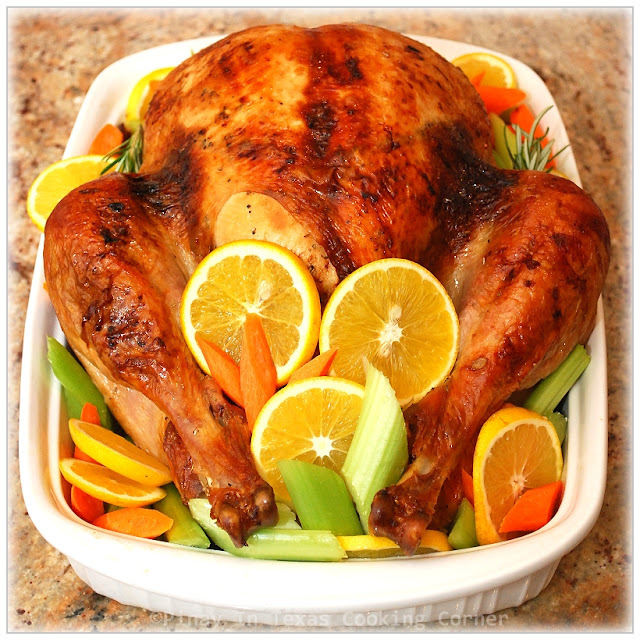 Remove the bird from brine and rinse inside and out with cold water. Discard the brine. 2. 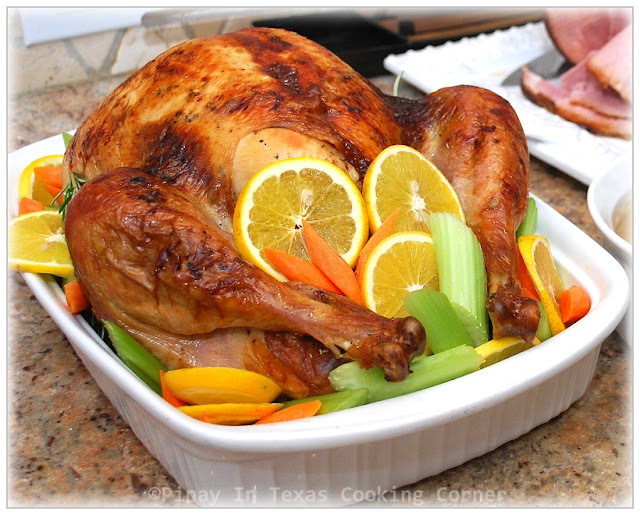 Place the bird on a strainer or roasting rack and pat dry with paper towels. Combine the olive oil and McCormick seasoning, set aside. 3. Combine the apple, orange, onion, celery and rosemary in a bowl. 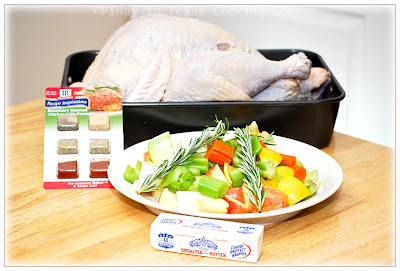 Lightly coat the cavity with the rub mixture and then add the aromatics to the turkey's cavity. Coat the skin liberally and some underneath the skin (in the breast portion) with the rub mixture. Tuck the wings underneath the bird. 4. Put about a cup of water in the roasting pan. This will prevent the drippings from getting burned. Arrange the turkey on the pan's roasting rack. Roast the turkey on lowest level of the oven at 400 degrees F breast side down for 30 minutes. 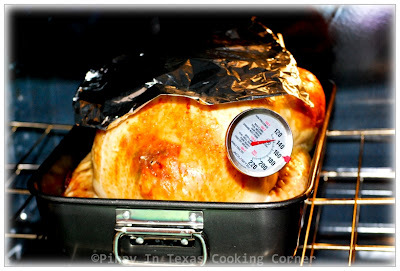 Turn the bird breast side up and insert a probe thermometer into thickest part of the breast and reduce the oven temperature to 350 degrees F. Set the thermometer alarm (if available) to 161 degrees F.
5. When the breast skin starts to brown, cover it with a foil to prevent it from over cooking. A 14 to 16 lb bird should require a total of 2 to 2 1/2 hours of roasting. 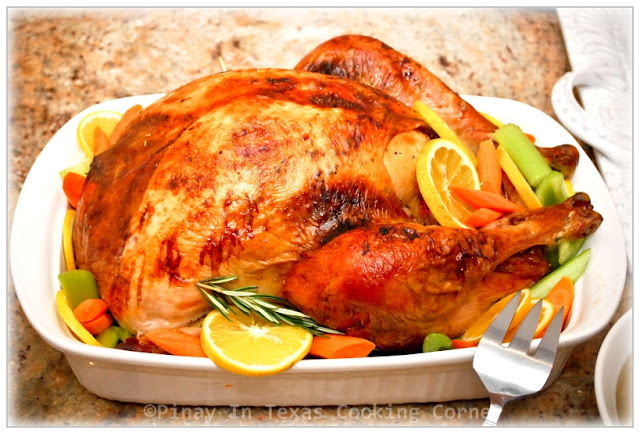 Let the turkey rest, loosely covered with foil or a large mixing bowl for 15 minutes before carving. 6. Garnish with fresh oranges, carrots and celery, or as desired. 1. 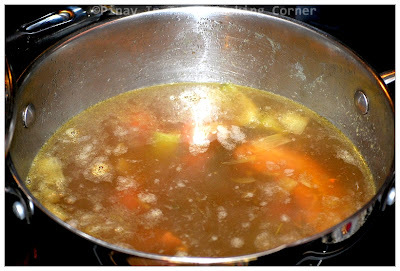 Combine the turkey neck, heart, gizzard, carrot, onion, celery, bay leaf and water in a pan. Bring to a boil and lower the heat to medium-low and simmer until about 30 minutes. 2. Strain the stock into a clean pot or large measuring cup. Pull the meat off the neck, chop the neck meat and giblets, and set aside (if you don't like the neck meat and giblets you just skip this part). 1. In a heavy saucepan, melt the butter over medium high heat. Stir in the flour and cook, stirring constantly, to make a light roux. 2. Add the hot turkey broth, whisking constantly, then simmer until thickened, about 10 minutes. Add the reserved chopped neck meat and giblets to the pan and adjust seasoning with salt and black pepper to taste. You may also add some pan drippings for added flavor. Mix well. Pour into a gravy boat and serve. Happy birthday! You have been busy with a lot of celebrations around this time of year. This turkey looks amazing. I like that Ryan used fruit as well as veggies for your aromatics and for encircling the bird. If he has been working on this for the last 7 years, it must be perfection and well worth a few ooohs and ahhhs when presented at dinner parties. Great recipe! That's a beautifully roasted turkey! Brining is definitely the way to go. Wishing you and your family a Blessed Christmas and a Happy New Year! happy birthday! happy holidays too, Ms Tina! The roast is done to perfection Tina and this one is something I look forward to during Christmas, hopefully I get to taste it this year too. I am not sure whether you will on for blogging as Christmas is just around the corner so, Merry Christmas and advance Happy Birthday to you. God Bless everyone at home and your goodself too. Take care Tina. What a grea recipe. I love it, look at that perfect skin, that color is killing me. Beautiful. Thanks for sharing. Happy birthday and Merry Christmas! BTW, just did a review for Samsung. For some last minute shopping or u may wanna drop hints to your partner to get u this awesome gadget. Chk it out! Samsung Galaxy Note Review: Is It A Phone Or A Tablet? Hi there!!! This comment maybe too late but I was the one who requested this recipe to be posted in details. And guess what! The turkey was a hit during our Christmas lunch with friends.. THank you so much for sharing your recipe. Your such a big help. God Bless!! Keep the recipes coming. And oh, I tried your window cathedral too. Another thumbs up from my guests. Gorgeous bird Tina! It looks fantastic! Congratulations! We wanted to inform you that this post has been selected as a Featured Archive Post on our site for the last two weeks of December 2012.